Automated Guided Vehicles (AGVs) can bring you many benefits. For instance, they can ensure a constant supply of materials to your production line or work stations. Or simply transport your materials where they are needed. MAXAGV is cost efficient since it helps you avoid costs which are normally caused by manual forklifts, such as damage to equipment and materials as well as personal injury. No fixed structures are needed and the MAXAGV system can easily be changed and extended as your facility changes. In this sense MAXAGV is a flexible material transport system. When an AGV is free it can take this opportunity to travel to a battery charging station. This is done automatically without having to remove the battery and allowing the AGVs to operate 24/7. Our AGVs are designed to work in a manned environment and are equipped with several safety systems. 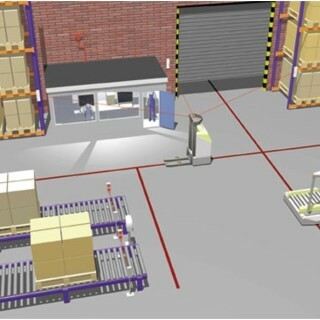 Laser safety scanners detect if an object is infront of the AGV, and bumpers and safety edges brake the power in the event of a collision. Warning sounds, lights, and emergency stop buttons are also some safety systems on our AGVs. If anything should happen, the Max control system sends an alarm to your phone or computer. Our software system also has many benefits over other systems on the market. We use Max which is a Windows-based system. It is very user friendly and easy integrate with any current management system you may have in your facility. In sum, MAXAGV is a flexible, cost efficient and safe product.